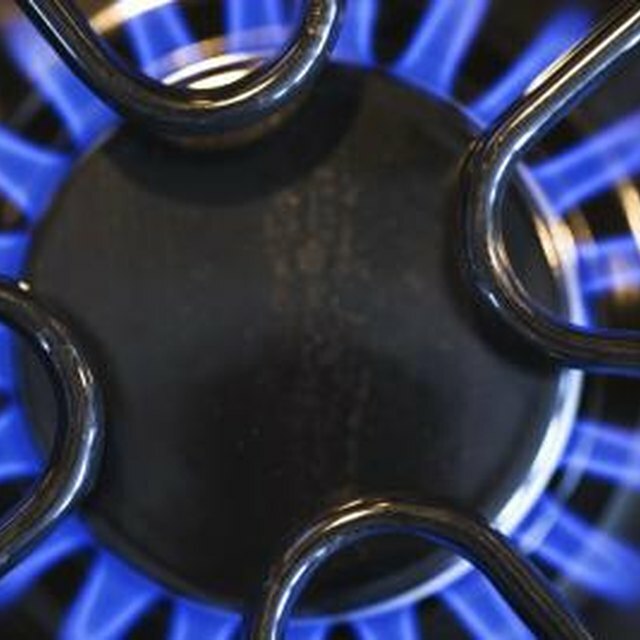 Anyone who has ever used a kitchen stove--whether electric or gas--has at one point made a mess and had to clean the burners. Stove-top burners are normally easily removed and generally take less than an hour to clean. Most food that is splashed onto the burners is burned off, but there may be some persistent grease and grime that will take a little longer to clean. Soaking your stove top burners in a sink filled with hot water and dish soap is the best way to loosen dried-on grime and cooking oils that may coat the burners. Turn your stove off and, if it's an electric stove, unplug it. Make sure the burners have completely cooled off before touching them. For an electric stove, lift and remove the coil burners at the electrical connection point and place into the water with their electrical connections above the water line. Allow to soak for at least 30 minutes. Gas stove burners are easily removed simply by lifting them off the stove top. You can submerge these burners completely in the soapy water. Again, allow to soak for at least 30 minutes. After soaking, they may need a little scrubbing. Make your own abrasive cleaning solution by mixing two tbsp. baking soda, one tsp. dish soap and two cups water. This should work on the remaining stubborn bits. Use a washcloth dipped in the cleaning solution. If there are still some resistant bits, use a steel wool pad dipped in the cleaning solution. Some people simply wiping off the burners with a cloth or paper towel; others thoroughly dry them by placing them in a 300 degree oven for about 15 minutes. Be sure to let them cool before putting them back on the stove.